The rhythm structure of Lindy Hop describes how the footwork for longer moves is broken down into smaller units. These smaller units are two beat intervals in the music, against which the dancers perform either an odd or an even number of steps. There is a huge range of possible movements for the individual steps, but the majority of the movements in common use are a much smaller subset. A simple step is a movement that transfers the dancer's weight from one foot to the other. Because Lindy Hop is danced to fairly fast music, it is important that the dancers take these steps with their knees slightly bent and their weight forward on the balls of their feet, so that they can react and move quickly. 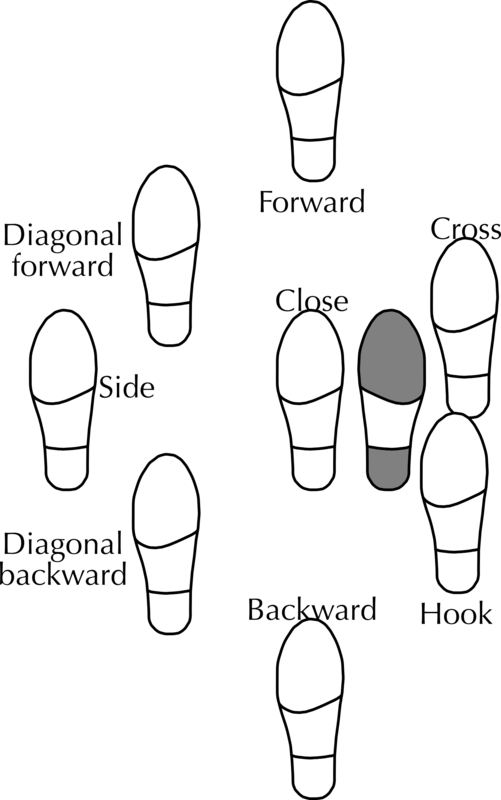 Each step can move the dancer in a variety of different directions—forwards, backwards, to the side—but it's also possible for a step to leave the dancer in roughly the same place. The simplest in-place steps are to replace the moving foot back in its previous position, or to bring the moving foot next to the stationary foot. However, the moving foot can also cross in front ("cross") or behind ("hook") the stationary foot, often in preparation for a rotation. The only variant of a straightforward step that is commonly used in Lindy Hop is the twist step. In a twist step, the dancer steps forwards with their foot pointing out to the side; this also means that the dancer's hips turn slightly in that direction. With a second twist step, the dancer's hips rotate back in the other direction; this also results in the back, non-stepping foot swivelling in place on the floor. For a sequence of twist steps, the net result is a hip and foot swivelling action. For foot movements that don't transfer the dancer's weight from one foot to the other, there are a wider variety of possible actions for the free foot. The foot can be placed flat on the ground, as for a normal step but without the transfer of weight. The foot can be placed on the ground with either the heel or the toe of the foot lifted. The foot can be held off the ground, with the knee bent (known as a "stag" position). The foot can kick in any direction. In Lindy Hop, kicks are normally done with the toe pointing down. The foot can tap percussively off the ground, using the toe, the heel, or the whole foot. The foot that is holding the dancers weight can also do things—the dancer can jump or hop on that foot, or slide across the floor.